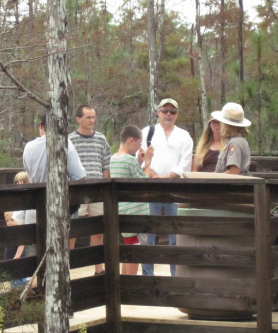 Join Big Cypress National Preserve Rangers Saturday at the Festival for a leisurely one mile walk on the trail at North Collier Regional Park. Along the way, you’ll discover interesting facts about Florida panthers, learn about their habitat, and look for tracks and other signs. You’ll also meet one of the Preserve’s panther biologists for a special demonstration and hear about the research they’re doing in the Preserve. Tours begin at 9:00am and 9:30am and will be approximately 2 hours in length. Meet at the boardwalk trail-head behind the Exhibit Hall. Registration is limited to 15 participants per tour. Appropriate for ages 12 and up. There are no restrooms along the trail, however there are restrooms available in the Exhibit Hall. Guests can join The Ritz-Carlton, Naples’ Randy Sarton, a certified Florida Master Naturalist, on two nature walks in the afternoon. 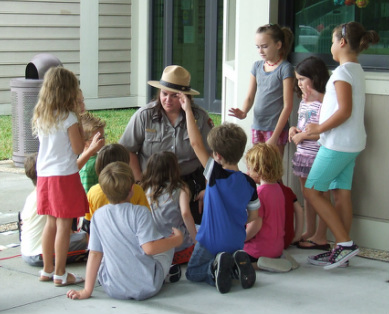 Ranger Randy will be leading the 30-minute activity with an emphasis on "Learning how to observe nature and take in all its wonders” or in other words, “How to become a Nature Detective." Stocked full of tons of fun activities, the Kid's Activity Room will provide an area where kids and parents can come relax and spend some time indoors. Watch a puppet theater production, build a panther puppet, color-in pictures of Florida wildlife, or just enjoy the air conditioning. Nature on Wheels is hosting the Kid's Activity Room. There are many influences in the life of a Florida panther. If these influences exceed the limit of tolerance for the Florida panther it becomes a limiting factor. In this fast paced and active activity, participants will move across the field like a Florida panther on the prowl.